Laura has been singing nearly as long as she’s been talking, and started studying with Tom in December 2010. 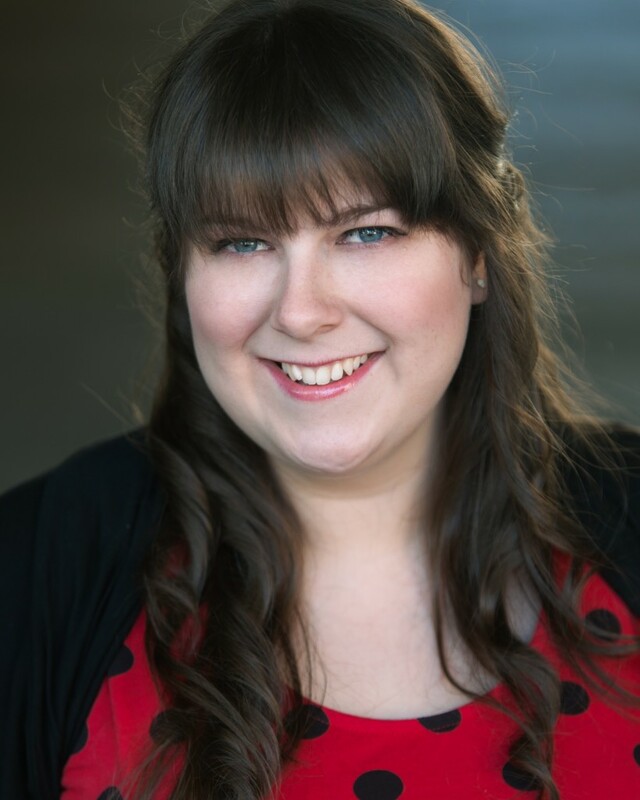 Since then, she has gone from committed student to Certified IVA Instructor studying with voice teachers across the globe. Her student base consists of a variety of students singing popular music and Musical Theatre, and even one or two complete beginners. When did you first know you loved singing? I’ve loved music and singing since I was very young. The earliest memory I have of singing solo on stage is when I was nine years old, in a children’s production of Wind in the Willows. I remember the microphone being very heavy, the lights being hot and all these people watching me! I loved it though, and performed with a number of Musical Theatre groups until I went to University. After university, I joined another Musical Theatre group and dabbled in some choirs in Edinburgh until I found Tom’s studio. My love of singing has always been there, I can’t imagine my life without it! So, you’ve done a lot of performing then? Yes, I guess you could say that, mostly in amateur roles! I’ve performed in venues large and small, the most notable being the London Palladium in the year 2000 with the theatre group I belonged to – we did a Millennium Show right in the middle of the run of “The King and I”. The smallest venue I’ve performed in was a church hall in an amateur production of Cinderella, seating about 30 audience members at most. But, it doesn’t matter how big or small the venue is, once I am on that stage, I love every minute of it. Most recently, I joined the Edinburgh based ‘Bohemian Lyrical Opera Company’, and performed with them from 2011-2013 in their concerts at the Edinburgh Fringe Festival, and in their production of Carousel in 2012. Unfortunately, since beginning my teacher training and working two jobs, the performing had to take a back seat for a while. However, now that we have Vocal Edge Choir up and running it looks like my performing days are back! My musical influences vary from Andrew Lloyd Webber to Whitney Houston to Rammstein! My favourite genre of music is Musical Theatre, although I’ll listen to just about anything with good singing in it. I remember watching Phantom of the Opera when I was 15 years old in the West End in London, and I loved it so much I saw it twice in 4 days. I loved the atmosphere of getting lost in the music, and in the story, and I remember wishing that I was the one on stage making the audience feel that way. I guess you could say that it was at that point I knew I would be a singer in one capacity or another in my adult life. Did you have singing lessons before you found Tom? Yes, part of the musical theatre group I belonged to did group lessons, but I had some private lessons when I was a teenager, after my Phantom experience. I had several lessons with a local singing teacher, but the lessons just didn’t work for me; I felt like I wasn’t progressing with my voice or musicianship at all. I dabbled in online singing lessons whilst studying at University, but they didn’t work for me either. I actually felt like my voice was worse afterwards! When I finished my degree, I moved to Edinburgh and decided to try out a lesson with Tom to see if I could find something that worked for me. Immediately, he explained in an understandable way what was going on with my voice, and how to fix it. After one lesson, I left the studio feeling like I was walking on air with a big stupid grin on my face. Finally, I had found something that I could understand, and that actually made a positive difference to my voice within 60 minutes! I wanted to give other people the same feeling I had after that first lesson with Tom, that nothing is insurmountable, and there is always something that works for you. I also attended a workshop day about a year later with a higher level teacher of the same technique that Tom taught, and she was so concise and clear in her explanations, that I just wanted to know more. By this point, I had studied with Tom for nearly a year and the technique had made such a difference to my voice that I wanted to help other people realise how effective the technique actually is. I also saw in this an opportunity to spend my adult life singing and helping other people to enjoy singing too, so really it was a no-brainer for me! The next logical step of course, was to start the teacher training program (which I did six months later), and the rest as they say, is history! What’s your favourite part about being a teacher? My favourite part about teaching is seeing the student grow in front of your eyes, both vocally and with confidence in themselves. It’s so rewarding to see that happen, sometimes within the space of a lesson, and when you look back at where they started, it’s amazing how far they’ve come. Teaching is hard work, but so enjoyable it hardly feels like work sometimes! You get to meet so many people from all walks of life, singing such a variety of songs, that teaching just never gets old. What’s your favourite part about being a Certified IVA Instructor? I absolutely love being a Certified IVA Instructor, I can’t define just one thing that is my favourite! I love the camaraderie of the teachers in the program, I have friends in countries across the world and we have access to so many learning opportunities, it’s mind-blowing. Our yearly Teachers Conference (IVACON) is always amazing, to be able to connect with people you wouldn’t normally see, and of course the teaching content of the days is fantastic. We get access to so many professional voice teachers, voice scientists, performance coaches, you name it in the world of singing, we have access to it, and it’s because we all work together as a team. I also love the way we teach through IVA. We believe that due to the nature of the voice as a musical instrument, each person’s voice is different and should be taught as such. IVA doesn’t presume to ‘put you in a box’, it encourages you to find your own style with the correct tools and techniques. This is very important to me, I have been shoehorned into many boxes that didn’t fit my personality or style, so freedom to be the singer I want to be and passing that onto my students is paramount in my teaching. 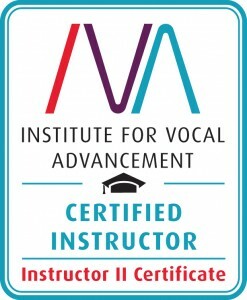 IVA gives me that opportunity within a framework that works for 90% of all singing styles so I can help more people achieve their goals. So, in a nutshell, you enjoy your job then? Absolutely, yes, without a doubt! I have worked hard to get here, and I want to help my students get the best from their voices. Seeing someone’s face light up as they just “get” it, and working to make it a good habit in their voice is the best job satisfaction I could ever wish for. Certainly it beats meeting sales targets, and collecting pointless statistics that nobody ever looks at! Do you think you’ll reach a point where you can’t learn any more? Good grief, no! As both teacher and student, we never stop learning, and that’s the beauty of this technique – there is never an end point. Every time I get a new student in front of me, I have something to learn from them, just as much as they have something to learn from me. It’s the same thing when I have my singing lessons, except I’m the student in that situation. I never want to stop learning, because when I do, I will think that I know it all and have all the answers. By this point, I’ll be in trouble because nobody can ever have all the answers, it simply isn’t possible. Just like no singer is ever perfect – we can strive for perfection and we can nearly reach it, but we won’t do because we can continue to refine what we have into something else. Can you give one piece of advice to aspiring singers in 50 words or less? Don’t dream it, be it! Follow your dreams, and if that leads you somewhere you never thought possible from your current situation, then perhaps you were supposed to get there eventually. You are the only one who can make your dreams come true so get out there and do it!